Note: The internet is pretty flakey here so the posts have slowed down a bit. Greetings from Phang Nga, a sleepy little seaside town about a half hour north of Phuket. Arrived here from Bangkok yesterday for some beach time and pure relaxation, which is about the only thing place is selling. 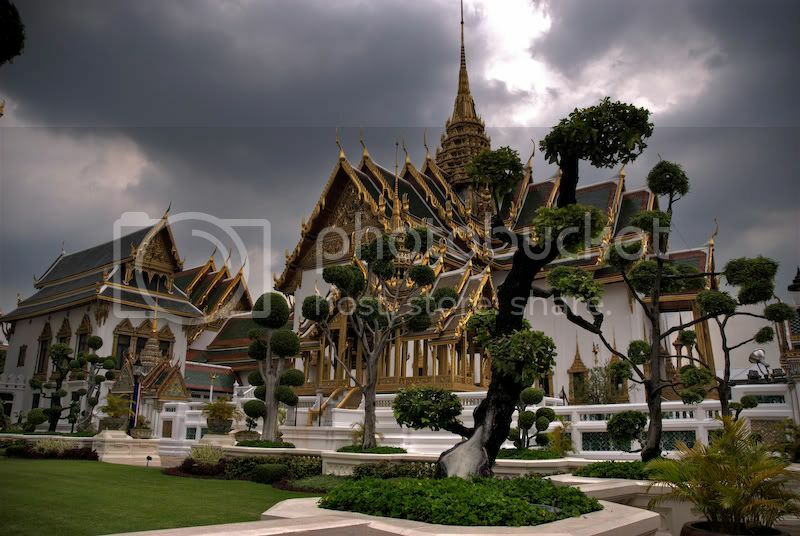 The picture above is from the Grand Palace in Bangkok. Phuket and the coast is for later. Also, the internet isn't very good here so I'll need to be economical with the pictures. I spent about a day or so in Bangkok, seeing the main sights and points of interest. They're mostly concentrated in one area so its not hard to do a "greatest hits" tour in about a day. Bangkok is a mostly dirty, noisy and hot place so if you do visit Thailand, spend a day or so here, and then head out to the coasts. I met up with Jessica Chiang in Bangkok, but just missed Matt Poehler. We're meeting up with him in Phuket for dinner at Peter Warner's suggestion, Baan Rim Pa ? greatest Thai food in the world, I'm told. That's a tall order, because everything I've eaten to so far has been excellent. Continuing acknowledgments, thanks to Lori Brockman for suggesting Moon Bar, and thanks to Gap Travel for shrewdly negotiated rates at the Peninsula, undoubtedly Bangkok's best hotel. Saw the Grand Palace, the famous Reclining Buddha and several ancient Wats and points of interest. I rode the tuk-tuk, a Thail motorcycle taxi, and got to breathe the exhaust just like a local. Having drinks at the Moon Bar was a terrific experience, an open-air bar on the 61st floor rooftop of the Banyan Tree Hotel. (Forget for a moment what I say below about things being cheap, the drinks at Moon Bar were priced to match the view: HIGH). Went to Patpong. Yikes. Getting around in Bangkok is pretty easy. From the Peninsula Hotel, you can take their boat over to the public peer and commute up and down the river via water taxi, which is about 20THB, or around $0.60. Taking the cross-river ferry costs about 3THB, our less than $0.10. Despite being Thailand's biggest city, Bangkok is pretty inexpensive. Lunch at a riverside cafe (noodles and "meat" plus two beers) won't cost more than 150THB, and the most popular tourist attractions, including the Grand Palace, don't cost more than 100THB. For US and European travelers, Thailand has been a destination of choice for years because its relatively inexpensive, extraordinarily beautiful and the people are some of the most gracious and hospitable you'll meet anywhere. Thailand's currency remains inexpensive because of an overall low productivity rate and a host of not insignificant political issues. Thailand has been quietly battling a growing Muslim insurgency in the south along its border with Malaysia, and political corruption has been rampant for years. It should be noted that there is no acting government at the moment. The military toppled the elected Prime Minister last September and he remains in exile in London to this day, recently brought up on somewhat dubious charges of corruption and fraud. The stabilizing force for the Thai people is the King, who is highly revered. His portrait is everywhere the entire country stops daily at 6:00 PM for the Thai National Anthem sung in his honor. (There are no constitutional protections for free speech against the King, so I would also like to add, "Long Live the King!"). Thailand has been relatively stable for foreign investment in tourism and hospitality, mainly large luxury resorts, but other sectors have not attracted as much attention and a result the economy is still highly dependent on tourism. Given its recent political woes, I don't see Thailand becoming an expensive destination anytime soon. When I arrived from Hong Kong, I changed my $500HKD to Thai baht and I still have a mountain of that money. The point of all of this is: Thailand is cheap, beautiful and inexpensive. Spend about a day in Bangkok and head out to the coast. There are several highly competitive regional airlines that have sprung up in recent years. The flight to Phuket from Bangkok (about an hour) was $42USD. 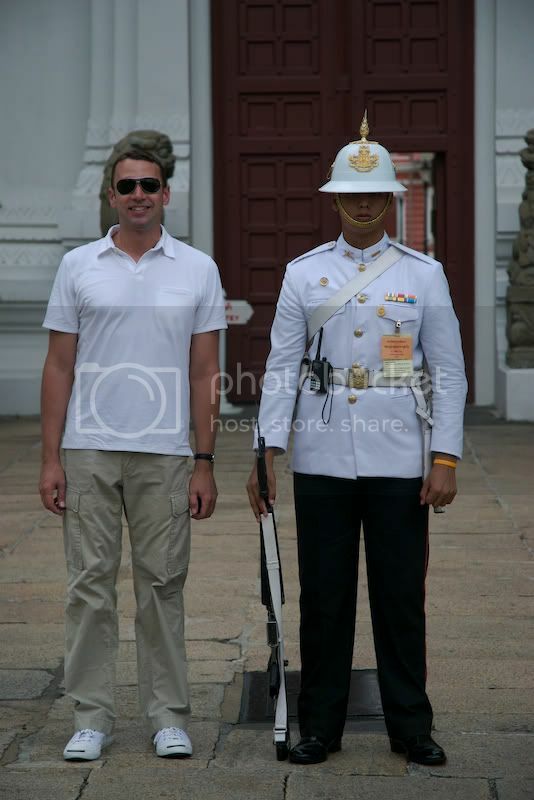 The picture below is with me and one of the near-motionless guards at the Grand Palace. Its worth noting that the guy did not indeed move. It was nearly 100 degrees and it's a wonder these guys don't faint. The Grand Palace is a strict dress code thus I'm wearing pants, and the white shirt is to address numerous reader complaints.